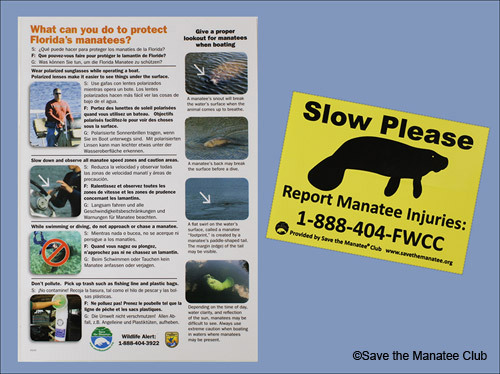 The public awareness materials listed below can be obtained by contacting Save the Manatee Club via email at education@savethemanatee.org or by calling toll free at 1-800-432-JOIN (5646) or 407-539-0990. 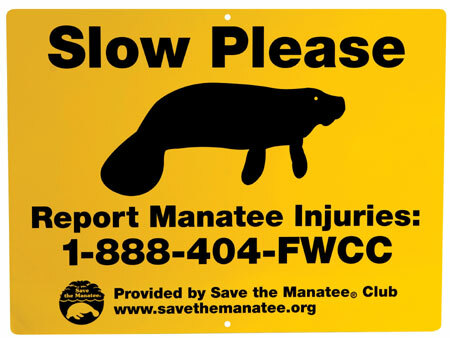 The sign, which is aluminum and 24″ x 18″ in size, reads, “Slow Please — Report Manatee Injuries: 1-888-404-FWCC.” It is designed to alert boaters to the presence of manatees in the waterways. Florida shoreline property owners can post one on their dock to let boaters know that manatees might be in the area. When contacting Save the Manatee Club to request a sign, please give us the address where the sign will be posted and your mailing address (if different). Signs are also available for shoreline property owners in states outside of Florida. In Alabama, please call Dauphin Island Sea Lab’s Manatee Sighting Network at 1-866-493-5803. All other state residents, please contact Save the Manatee Club at education@savethemanatee.org or by calling toll free at 1-800-432-JOIN (5646). The boating safety packet ontains a weatherproof boat decal with a hotline number for reporting manatee injuries, deaths, or harassment. It also includes a waterproof waterway card with manatee protection tips that was created in conjunction with the Florida Fish and Wildlife Conservation Commission and U.S. Fish and Wildlife Service. Laminated with a hole in the corner, the waterway card can be easily hung and kept on board your vessel. Click here to see a pdf of the waterway card. The boating safety packet also comes with our If You Love Me, Please Don’t Touch or Feed Me brochure. The Club produces bright yellow, waterproof boating banners and provides them to Florida boaters to help warn other boaters when manatees are sighted in the area. 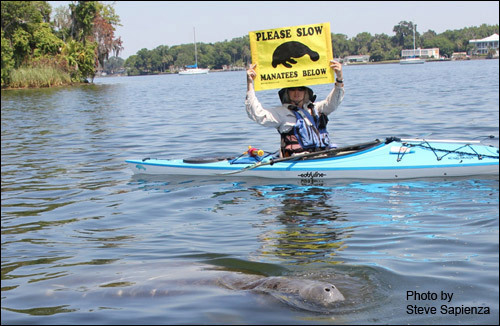 By carrying the “Please Slow Manatees Below” banner in motor boats, kayaks, and canoes, it becomes easier to alert other boaters to the presence of manatees. Save the Manatee Club and the Jacksonville Zoo and Gardens teamed up to create a public awareness sign to teach Florida’s residents and visitors of all ages how to behave responsibly when manatees are near and to help safeguard the endangered marine mammals from harm. The 2-foot by 3-foot full-color sign features the “Buddy” character created and illustrated by Florida artist and author Tim Thomas, who donated the use of his character from his children’s books for the sign project. 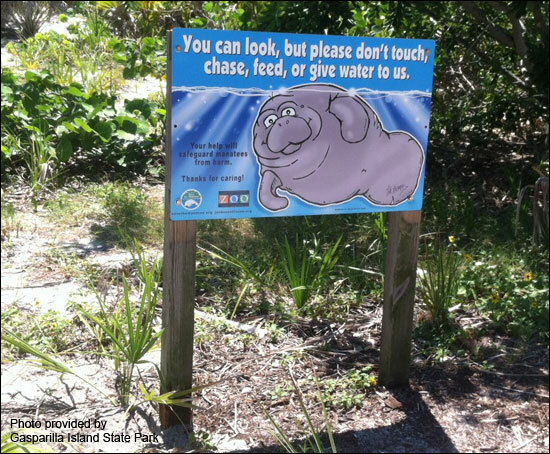 The signs are distributed to state, municipal, and county parks; marinas; and other sites where human/manatee interaction can be a problem, resulting in manatee harassment. 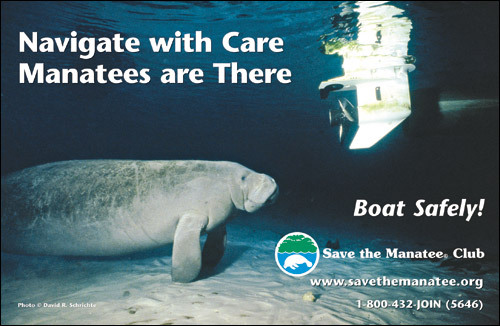 Save the Manatee Club has created an 11″ x 17″ poster that features the conservation message “Navigate with Care, Manatees are There: Boat Safely!” The posters are available to Florida businesses, organizations, schools, or libraries who are interested in displaying them in store-fronts and high traffic areas to help spread the word about manatees. 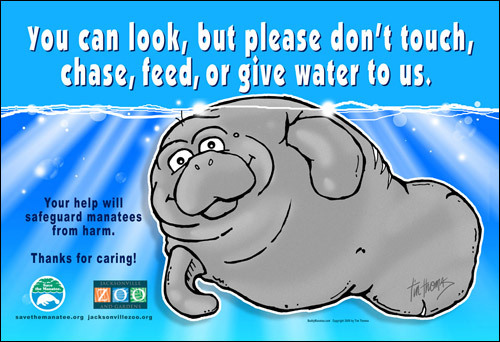 An 11″ x 17″ poster that features the Buddy Manatee character created by Florida artist Tim Thomas and the conservation message “You can look, but please don’t touch, chase, feed, or give water to us.” The posters are available to Florida businesses, organizations, schools, or libraries who are interested in displaying them in store-fronts and high traffic areas to help spread the word about manatees. 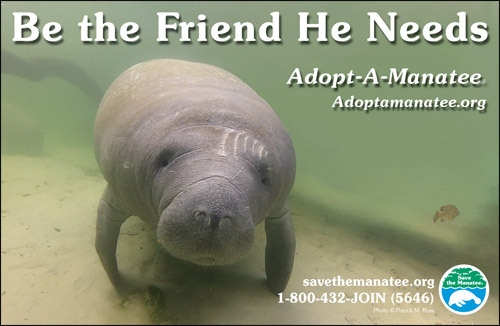 An 11″ x 17″ poster that promotes manatees and Save the Manatee Club’s Adopt-A-Manatee® program. The posters are available to Florida businesses, organizations, schools, or libraries who are interested in displaying them. Click the following button below to download our free brochure. You can also request the brochure by regular mail by sending an email to education@savethemanatee.org or calling our toll-free number at 1-800-432-JOIN (5646). A screen from the introductory module for the Springs Conservation in the Classroom and Beyond program. Click the link below to get Modules 1 – 7. This course is geared toward high school students and the general public. The program consists of seven modules, designed to inform students and promote critical thinking. 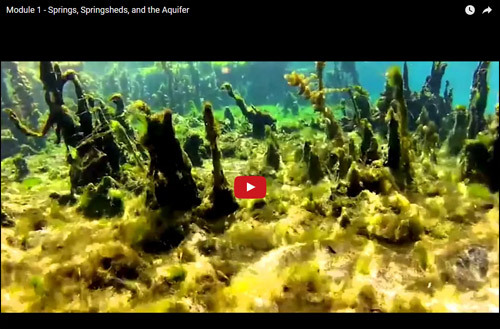 The course introduces students to aquifers, springs, and springsheds, discusses their importance to the Florida water supply, and evaluates impacts from development, pollution, and groundwater pumping. The modules also serve as a primer on Florida water policy and help students develop the skills needed to participate in policy formation. Click the following link to view the course online as a series of YouTube videos or get links available for download in Powerpoint format.